Our highlight today is a Brand-new edition of Life Speaks with Michele Zirkle Marcum. 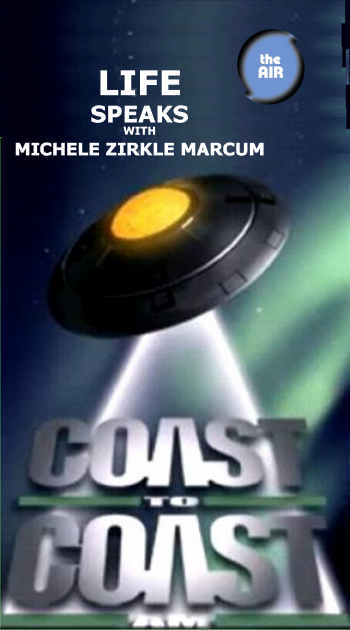 Michele, an author from Point Pleasant, WV– home of the Mothman– was a guest on the nationally syndicated radio show, COAST TO COAST with Dave Schrader. This is the largest paranormal broadcast in the nation and they interviewed Michele about her book, RAIN NO EVIL and her own experiences with the supernatural world. Marcum describes her paranormal story of liberation from evil spirits that entered her West Virginia home and attached to her. This week Life Speaks brings you excerpts from her appearance. You can hear Life Speaks with Michele Zirkle Marcum Wednesday at 1:30 PM and 7 PM on The AIR, with repeats throughout the week. You can also listen to archived episodes at her website. And don’t forget to listen to The AIR all day long and just chill out, man. 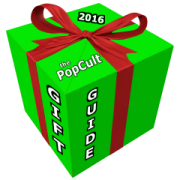 I’m sure many PopCult readers have someone on their holiday shopping list who desires, nay, even craves, all things cute and cuddly.This is for them. It’s Adoptimals. Originally created as an adjunct to Cabbage Patch Kids, these cuddly critters proved to be so popular that they have cultivated a following of their own. 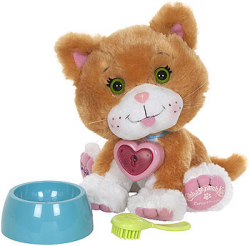 Intended for ages three and up, these are actually pretty great gifts for people who cannot have “real” pets due to allergies or other medical issues. These 9” furry little friends are back with four new styles for 2016. 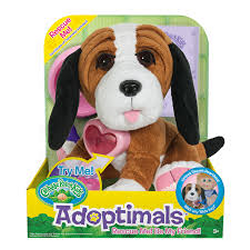 The Adoptimals are the Cabbage Patch Kids’ best friends and YOU hold the key to their little hearts. 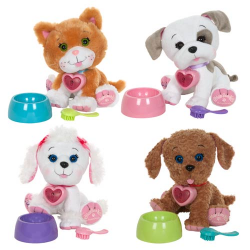 They are loaded with cuteness and include pet sounds, phrases and a special heart-shaped locket. You can pair them with one of the 14” Cabbage Patch Kids’ heart key bracelet and unlock your pet’s magical locket for lights and a heart beat, or simply collect and play with them all on their own. You can choose from seven different puppies or kittens. Each Adoptimal includes a bowl and brush. Take the Oath of Pet Adoption and give your Adoptimal a name you choose. Suggested retail price is under twenty dollars and these cute plush animals are available at all major toy retailers. Here’s the perfect gift for the urban art aficianado on your holiday shopping list. A compact, coffee-table-ish collection of amazing street art from the Big Apple. 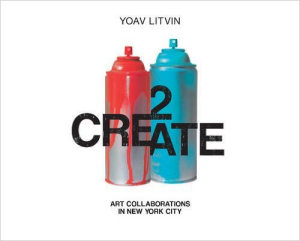 This beautifully designed book showcases the work of nine pairs of New York City’s finest graffiti and street artists, delving deep into their backgrounds, techniques, and collaborative processes. Each duo consists of artists with unique styles who come together to create a larger-than-life work of street art in a neighborhood in New York, the birthplace of modern graffiti. Witness the immense creative potential of collaborations that have produced stunning examples of classic graffiti, collage work, screen printing, and murals. Each chapter provides access to a mysterious underworld, leading readers to secretive meetings of creative minds out of which ephemeral, yet nonetheless remarkable, works are born and later transferred onto walls, rooftops, trucks, and subway platforms. The combination of revealing interviews and colorful action photography produces a narrative arc of relationships―formed between individuals from diverse backgrounds and creative upbringings―that follows the artistic process from creative spark to collaborative masterpiece. 2Create is for the modern art lover on your shopping list–the person who isn’t horrified by the sculpture in front of The Clay Center. You can order this book from any bookseller using the ISBN code, or snag it from Amazon. This suggestion is for the major-league comic book nerd on your shopping list. It’s also perfect for fans of intricate caricature work. More Heroes of the Comics: Portraits of the Legends of Comic Books is another masterwork by Drew Friedman. 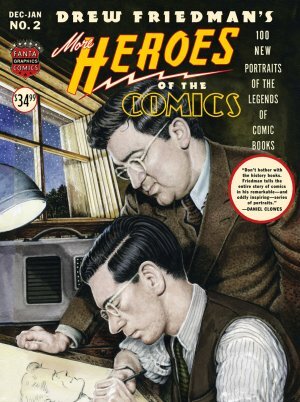 Featuring approximately 75 full-color portraits of the pioneering legends of American comic books, including publishers, editors, and artists from the industry’s birth through the brilliant artists and writers who fueled the industry’s first few decades, all lovingly rendered and chosen by Drew Friedman, a cartooning legend in his own right. Friedman is hailed for his distinctive style that depicts his subjects in absolute detail, warts and all, yet manages to find beauty within. With subjects popular and obscure, men and women, as well as several pioneering artists of color. Each subject features a short essay by Friedman, including Otto Binder, Gene Colan, Mickey Spillane, Don Heck, James Warren, Curt Swan, Patricia Highsmith, Jules Feiffer, H. G. Peter, Robert Kanigher, Audrey Blum, Nick Cardy, Ben Oda, Vince Colletta, Dan DeCarlo, John Romita, John Buscema, Kurt Shaffenberger, Mort Weisinger, Gladys Parker, Frank Robbins, Larry Lieber, and many more! Even the legends of comic book art are raving about More Heroes of the Comics: Portraits of the Legends of Comic Books. This book is, of course, a sequel to Heroes of the Comics: Portraits of the Legends of Comic Books, which was published in 2014. You should be able to order both of these books from any local bookstore using the ISBN code, or you can get them directly from Fantagraphics. Dream Girl is the latest collection of songs by Charleston’s own Ann Magnuson. Extrapolating on themes explored in her one-woman show, An Evening of SuRURALism™, which debuted during FestivAll in 2015, Ann explores the mysteries of dreams, what they mean, and the world in which they happen. This is a great gift for any fan of Ann’s work, any person interested in the dream world and anyone who likes music that has its roots here in the Mountain State, no matter how surreal it is. 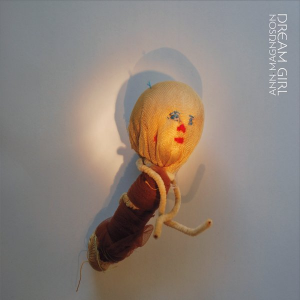 Dream Girl is a surreal dreamscape of spoken word and song. Spoken word has its roots in poetry and theater as well as the talking blues and rock music. Magnuson turned the genre truly psychedelic with brilliant and subversive dream-based lyrics in her band, Bongwater in the 1990s. With the exception of two cover songs (a moving rendition of the 1968 Glen Campbell hit, “Dreams of the Everyday Housewife” and a wistful take on HEART’S “Dreamboat Annie”), the 50-minute album features brand new original material that plumbs the depths of Magnuson’s fertile imagination. You can order Dream Girl and many other works by Ann at her new webstore, where you will also find special bundles and autograph options. We have recommended Wolfgang Parker’s Crime Cats book series for young readers here in the PopCult Gift Guide for the last two years, and now the newest entry in the series is an activity book, so you know it’ll make a great gift. Are you ready for face-melting Heavy Metal fun and mystery? 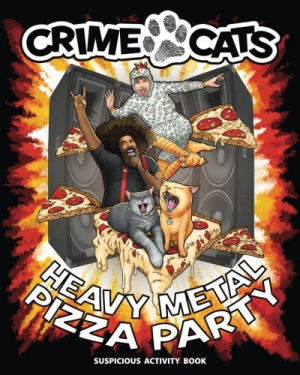 The Crime Cats Suspicious Activity Book is packed full of super-rad activities that can be played alone, with your friends, or even with your whole family—it’s up to you! In this book, YOU team up with the Chicken-Boy of Clintonville and his partners, cat detectives CatBob and Neil Higgins, to solve puzzles, master mazes, draw, and even become the author of your very own Crime Cats mystery! Wolfgang Parker is the accidental author and illustrator of the “Crime Cats” children’s mystery series. He wrote the first volume, “Crime Cats: Missing,” as a gift for his nineteen nieces and nephews and soon found people of all ages enjoyed reading the adventures of the Chicken-Boy of Clintonville and his cat detective partners. Wolfgang has been previously known as a music pioneer. His debut album “Hep City Swing” (1998) was the first Punk-Swing album ever recorded. After its release, his band went on to record three full-length albums, an EP, and a couple of vinyl 7″ singles. Then, during a creative lull, Parker picked up a camera and his artistic journey suddenly changed direction. The rocker spent a short stint being published as a fashion and art photographer before burning out on the grueling process. Parker was voted one of Columbus’ best authors in the 2015 ColumbusUnderground.com reader’s poll. He currently occupies duel roles as fiction writer and singer/bassist of a new band, Weedhaven Laughing Academy–both with releases due out in 2016. You’ve heard Weedhaven on Radio Free Charleston and we will keep you posted on his new projects. This is a great gift for young readers, folks who are into coloring and other activities and fans of Wolfgang. This book can be ordered from Amazon, or from any local bookstore by using the ISBN code above. This pick is for the remote control enthusiast on your shopping list, be they child or man-child. We’re covering two versions of the coolest RC motorcyle on the market, one of them updated with video capabilities. 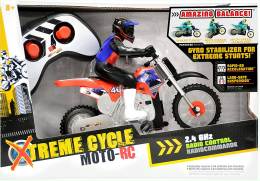 Selected as a winner of Good Housekeeping Magazine’s 2016 Best Toy Awards, and a Hot Holiday Toy of the Year 2016 from Boys’ Life Magazine, Wicked Cool Toys reintroduces the #1 selling radio control motorcycle of all time, Xtreme Cycle RC. Not content with just repeating the trails they blazed before, WCT has upped the ante with Xtreme Cycle Moto-Cam. Featuring a patented gyroscope stabilization system that made the original Xtreme Cycle such an amazing toy, Xtreme Cycle Moto-Cam not only uses that system, specially designed to always right itself after it falls for non-stop action, but the all-new Xtreme Moto-Cam takes it to the next level with a 640×480 VGA resolution built-in helmet camera, allowing kids to record video at 30 frames per second, and storing 12-15 minutes of video for action-packed replays. 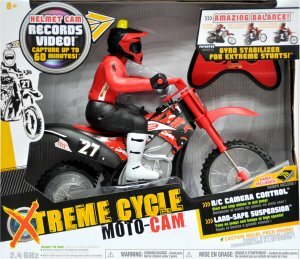 Kids (or adults) can capture Xtreme Cycle Moto-Cam’s flips, tricks and sharp turns, just like they do in extreme cycling, with a real working helmet cam.The Moto-Cam’s patented, real wheel gyroscope self-stabilizes while your cycle enthusiast films all the action! The sizable motorcycle measures approximately 13.75″W x 11.45″H and includes: Cycle with rider, built-in helmet camera, remote control, ramp, 512MB removable/upgradable SD card, 9V rechargeable battery, and a 12” USB cable to download, watch and share videos. All batteries are included. Recommended for ages eight and up, the suggested retail price is $79.99. Available at Target, Toys “R” Us and Amazon. 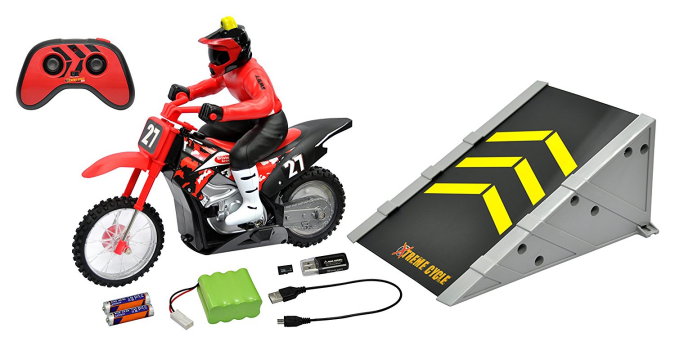 The original Xtreme Cycle RC is also available, if you just want to have hours of fun whipping around like a maniac via remote control. The suggested retail price for the camera-less model is $29.99, and available at the same retailers. This is perfect for kids who love extreme sports and RC fun…and for grown-ups, too. This is the pick for anyone on your list who’s interested in what was one of the most influential television shows of our time. a show that was sorely-missed during this past election cycle. 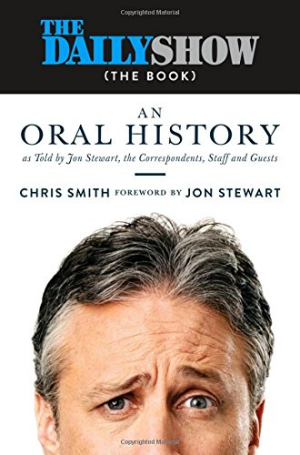 This oral history takes the reader behind the curtain for all the show’s highlights, from its origins as Comedy Central’s underdog late-night program hosted by Craig Kilborn to Jon Stewart’s long reign to Trevor Noah’s succession, rising from a scrappy jester in the 24-hour political news cycle to become part of the beating heart of politics-a trusted source for not only comedy but also commentary. This in-depth oral history will make us miss this show more than ever. This book can be ordered from Amazon, or from any local bookstore by using the ISBN code above. Local theater lovers have the chance to support Kanawha Players and also see a humorous and touching Christmas play this weekend. 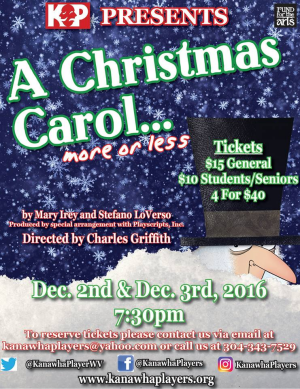 A Christmas Carol…more or less can be seen Friday and Saturday, December 2 and 3 at 7:30 PM at the Historic Labelle Theater on D Street in South Charleston. This soap-opera/farce take on the Charles Dickens classic is a show-within-a-show as Sarah and Charlie, a married couple who run a small theatre that’s presenting A Christmas Carol run into a series of major problems. Charlie shows up backstage to say the cast and crew are snowed out. Charlie is planning to split up with Sarah tonight, but he’s snowed in. Sarah, furious, capitalizes on Charlie’s remarkable memory, and blackmails him into doing the play with her as a duo, relying on scripts when they need to. Tickets are only fifteen dollars ($10 for students and seniors) and group discounts are available. 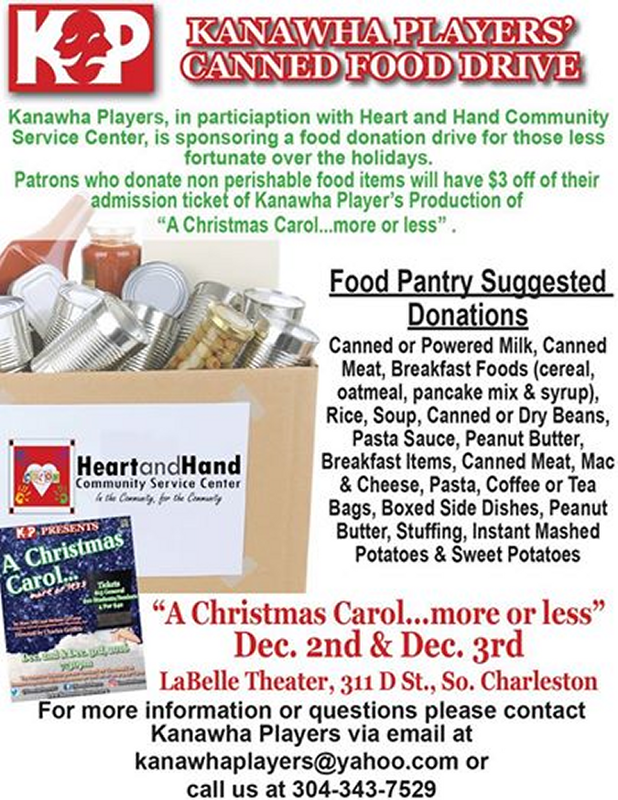 For reservations and more information contact KP at kanawhaplayers@yahoo.com or call (304) 343-7529. This is a perfect gift for the theater lover on your holiday shopping list. Plus you can donate food to a good cause and get a further discount on your ticket. Check the information below. A couple of weeks ago the Charleston music scene lost an amazing person. Tommy Fountaine was a giant in the Charleston music scene, a talented singer and drummer and an inspiration to his fellow musicians. He was a brother to his bandmates. Wednesday night at the Empty Glass, some of those bandmates are putting on a show to celebrate his life and to try and put some money together for his children. Our Gift Guide suggestion is that you attend this show (admission is a suggested donation of seven dollars) or purchase the CD, “We’ve Never Heard Of You Either,” by his band, The Diablo Blues Band, so you can experience just a little of the love of music that Tommy had. 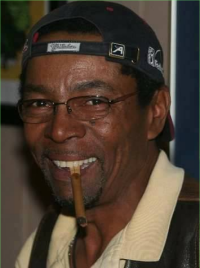 The celebration of his life will begin during Happy Hour at 6 PM with food and acoustic mustic by Debbie Grimm and The Red Lights. 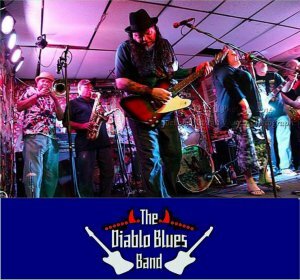 The bands will start at 8 PM with Robert Altman, The Spurgie Hankins Band, The Needful Things, Tommy’s Triple Threat Blues Revue, NonFriction and then, at the end of the evening, the remaining members of The Diablo Blues Band will make their final appearance, along with some surprise guests filling in for their fallen brother. All night long there will be a parade of guest musicians jamming together in memory of Tommy Fountaine. If you can’t make it to the show, you should order “We’ve Never Heard Of You Either.” This CD is a killer collection of rockin’ blues filtered through the mountains of West Virginia. It’s genuine, heartfelt music that will shake you to your core. It’s the perfect gift for the blues lover and supporter of local music on your shopping list.